Small - $29.99 Medium - $29.99 Only 5 left! Large - $29.99 X-Large - $29.99 Only 9 left! Yaaaaarrrgg! Are yee ready matey? Ready to sail the seven seas, that is? Aye, well ye won’t be ready until you grab this lovely Adult Ruby the Pirate Beauty Costume! Once ye slip yer body into these elegant garbs you’ll be sure to rule the ocean! 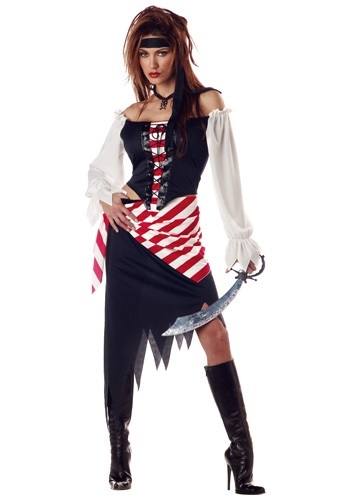 This spunky outfit will have you looking fit to take control of any pirate ship that you should happen to come across. Although it will be Halloween, so why not take charge of the party scene this year! Grab yourself a captain’s Tricorn hat and one of our plastic pirate swords, then you’ll look more than ready to lead everyone to the greatest Halloween they’ve ever celebrated. People won’t question your command. It will look as if you’ve been there and done it all; collected more booty than any pirate could ever dream of, fought off more ships than an imperial navy, and traveled to every shimmering shore there is. Grab a handful of friends to dress up as pirates as well and you can be the captain of the rowdiest crew of swashbucklers anyone has ever sailed across. When people ask for your name give them the alias Ruby the Pirate Beauty and you won’t have to worry about the law trying to take the fun out of pirating. If the pirate’s life is truly the life for you then get your hands on this lady's pirate costume and you’ll be ready for an amazing adventures this Halloween! Weigh anchor and sail off into the sun with this sassy outfit!